Milton Resnick, East Is the Place, 1959. Oil on canvas. Gift of Mr. and Mrs. Howard Wise, New York. Photo credit John Nienhuis. © Estate of Milton Resnick. My response: “I am so glad you would like to encourage your granddaughter’s love of art! I would love to help! We have an artwork in our permanent collection that sounds just right for her. It is East is the Place by Milton Resnick. It truly expresses the joy of colors living together on canvas and resonates with high energy. It is a very large painting, and I think she’ll love it. 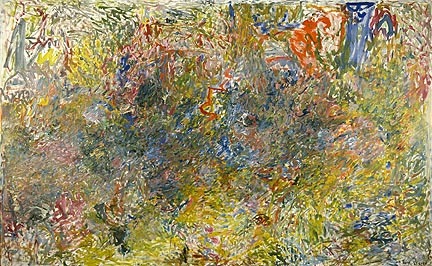 Also, the Bradley Collection has many examples of abstract expressionist artwork, alive with color. Work by Hans Hofmann, Ernst Wilhelm Nay, and Willi Baumeister are delightful. I hope that while you are here, you can visit during our Kohl’s Art Generation Open Studio hours. Throughout the year we host Open Studio every Sunday from 10am to 4pm. Family members of all ages can come create, and it’s free with admission. Also, during the holidays, we often extend open studio hours to weekdays. A couple of books that you may like to read with her are The Dot and Ish by Peter H. Reynolds. The characters in the books are young artists that find happiness in their love of drawing and painting (despite what anyone else says!) and they’re very cute. Janet Gourley is the Assistant for Education and Public Programs at the Milwaukee Art Museum. Her workday is spent facilitating programs, maintaining department attendance statistics, and knowing how to answer any and all questions about the Museum’s educational programs. This entry was posted in Education and tagged Abstract Expressionism, Bradley Collection, Ernst Wilhelm Nay, Family Programs, Hans Hofmann, Milton Resnick, Willi Baumeister. Bookmark the permalink. I absolutely adore the books The Dot and Ish !! They are so simple and powerful. I gave them to all my nieces, my nephew, my friends’ children, as well as, to my adult friends. Great recommendation!